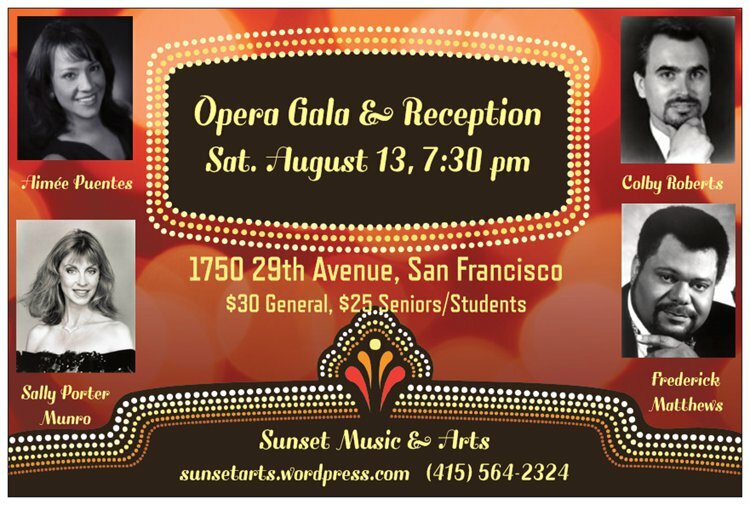 Opera Gala and Reception: Saturday 08.13.2016 at 7:30 p.m.
2016 Sunset Music & Ats Opera gala returns with artists from the San Francisco Opera Chorus: Aimée Puentes, soprano; Sally Porter Munro, mezzo-soprano; Colby Roberts, tenor; Frederick Matthews, baritone. Dr. Bryan Baker accompanies on the piano. This popular annual event will feature songs and arias from opera and musical theater. A free reception follows the concert. Date: Saturday August 13, 2016 at 7:30 p.m.
Aimée Puentes, soprano, has sung leading opera roles including, Zerlina in Don Giovanni, Despina in Così fan tutte, Micäela in Carmen, Sister Constance in Dialogues des Carmélites, Pamina in The Magic Flute, Musetta in La Boheme, Nannetta in Falstaff, Valencienne in The Merry Widow, Paquette in Candide, and Susanna in Le Nozze di Figaro. She has performed with the San Francisco Opera, Arizona Opera, Pensacola Opera, New Orleans Opera, Cincinnati Opera, Chautauqua Opera, Opera San Jose, Opera Southwest, West Bay Opera and Sacramento Opera. Sally Porter Munro (mezzo-soprano) is a native of London, England and a graduate of the Royal Northern College of Music, Manchester, England. While living in England she sang with the English National Opera, Royal Opera de la Monnaie in Brussels, and as an oratorio soloist in Europe. She also performed with the BBC Singers on radio and television. She is a full time member of The San Francisco Opera Chorus and has covered and sung a number of small roles. Ms. Munro has sung as a soloist with Pocket Opera, Berkeley Opera, North Bay Opera, San Francisco Lyric Opera, and Lake Tahoe Festival. Tenor Colby Roberts has sung with opera companies throughout the country, including Orlando Opera, National Grand Opera, Connecticut Grand Opera, New York Grand Opera and New Jersey State Opera and has been part of the chorus with San Francisco Opera for over 30 years. His concert performances have taken him across the United States, and to Europe and Israel. Bay Area credits include performances with San Francisco Lyric Opera where he sang Alfredo in La Traviata, the title roles in Werther and Andrea Chenier, Rodolfo in La Boheme, Pinkerton in Madama Butterfly and Cavaradossi in Tosca. Frederick Matthews (baritone) has been praised by audiences and critics alike for his appearances on the operatic and concert stages. International recognition came while on tour singing the role of “Jake” in Gershwin’s Porgy and Bess, when it was reported that he “projected evenly balanced singing and left an exquisite stage impression.” (Neue Presse – Augsburg, Germany) Now residing in the Bay Area, he has been seen in a variety of solo and bit parts with the San Francisco Opera. A Sunset Music | Arts and Verismo Opera joint presentation. Enjoy a comedic romp through Gianni Schicchi with a cunning con artist that tricks the greedy Donati family who are fighting over their dying relative’s estate. Laugh and weep with Canio, the clown, over the tragedy of a love triangle in Pagliacci. Both operas are full of gorgeous and well-known music, such as: O mio babbino caro and Vesti la giubba (the clown who cries behind his makeup). 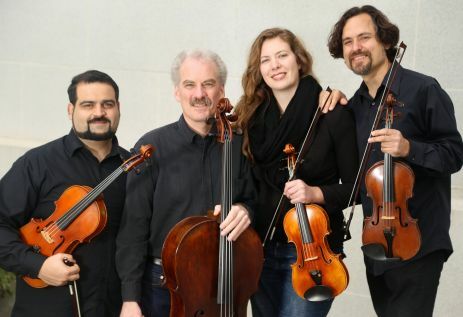 Date & Time: Saturday June 25 at 7:30 p.m.
A chamber music concert featuring music of David Ryther, Samuel Barber, Philip Glass, and Antonin Dvořák. Saturday January 16, 2015, 7 p.m.
Tickets are also available at the door on the day, if the show is not sold out. 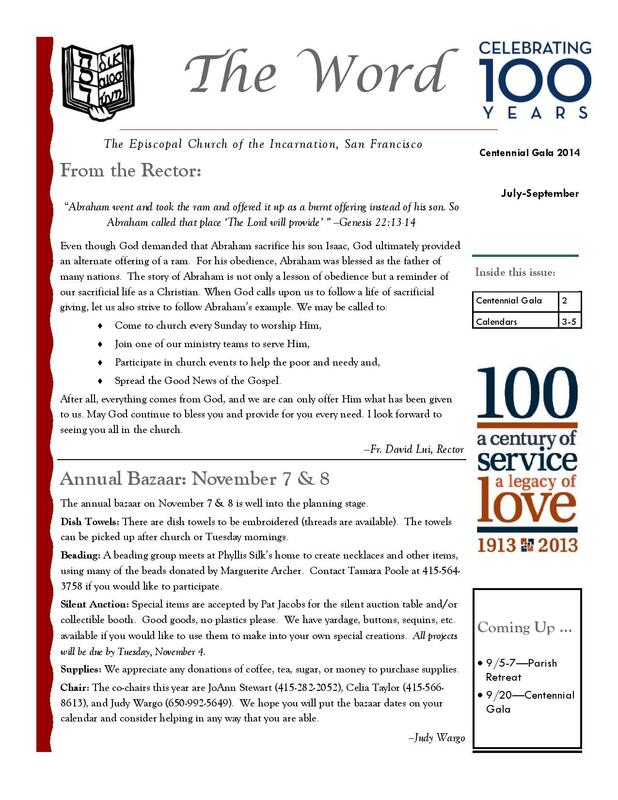 Read a review by Stephen Smoliar, San Francisco Examiner, Classical Music reporter. For more details visit http://sunsetarts.wordpress.com. Date & Time: Sunday October 18, 7 p.m.
Ms. Gaubert has sung leading roles in the US with the Utah Lyric Opera, West Bay Opera, Berkeley Opera, Santa Barbara Opera, as well as concertizes extensively in France.